Maaya: "We have a guest tonight"
A: No way, Masumi Asano? A: Hocchan!Ho, Ho.. Hoa... Hoa...!" At Maaya's fanclub event, tonight's only special menu was Yui Horie as a guest. 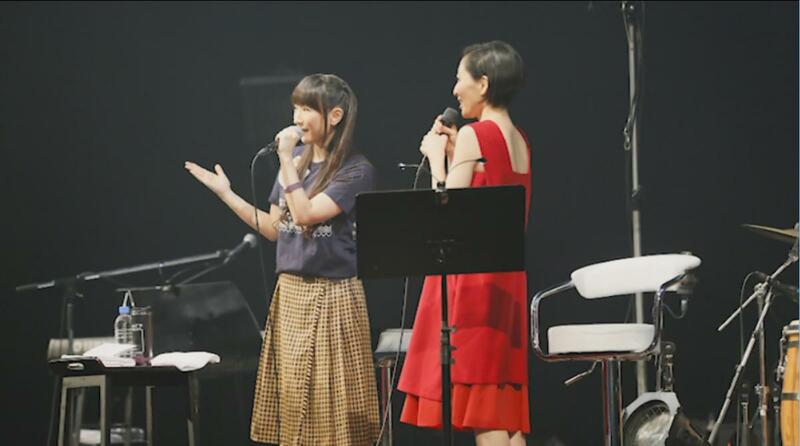 Sometimes creeping out Maaya herself, 30 minutes non-stop Maaya fan talk had the audience in stitches. She joined the fanclub in the first wave! VA production agency: "From now on you may become a pro, so you should stop fan activity". Applied to the fanclub without telling the management by writting her name in hiragana. Had no Lawson nearby so could not renew membership next year. - After getting invitation from Maaya to visit her place, friends said "Well, you certainly moved up!" - Everyone, you may also get invited some day, so don't give up! After first meeting Maaya in person (Risky & Safety), was so impressed by Maaya's clothes, that she went right away to Marui department store, found a simular outfit and bought it. Also found the same scarf but couldn't buy it because it was too expensive, which she still regrets until today. Would like to produce sheets and hugging pillow with Maaya on it. "I want to sleep in Maaya's arms". However, totally forbidden by Maaya. Was nagging Maaya's live staff to tell her the setlist, however they kept mum. Still, she kept bugging them until finally busted by Maaya. Got invited to Maaya's house with Masumi Asano. Was moved by the tastiness of food prepared by Maaya herself. Was not able to do it so left it to Asano-san and instead took up dish washing. However, even there she only managed to just stack the dishes without removing dirt. Yui Horie appears in a T-Shirt from the "In the silence" live (2011). And what more, sporting a badge from Hotchpotch(?) limited edition CD. Maaya is taken aback. Horie-san was a fanclub member in the first term. As she entered the VA training school, the management said: "From now on you'll be a pro, so stop thinking like a fan", but she still joined the FC while working. M. "Actually, now I'm not sure if I should say 'Horie-san' or 'Yui-chan'"
Y. "Please call me 'Yui-chan'~~~~~ I want you to call me 'Yui-chan'~~~~~~~ (clinging)"
M. "Huh, when was that?" Y. "During 'Risky & Safety'!" Y. "When I got the news, I was like 'Ohmygosh! I'm going to see Maaya Sakamoto in the flesh!'" Y. "So I was staring." M. "You were covering for some of the staff at the live"
Y. "Yes, you can see me on the live DVD". M. "But then you used this position to sound out the setlist"
Y. "Well, I was curious"
M. "As this became known, people stopped telling, so you kept looking for others who would"
M. "Would you please stop that?" M. "The other day you visited me with Masumi Asano"
Y. "Oh yes~~ Maaya-san's own cooking was totally delicious!" Y. "Can this actually be made by human hands?! Ah, what was that machine called?" M. "So since I was cooking, they asked if they can help with anything. 'Sure, cut some cabbage then'." M. "So they look at it intently and discuss 'Should we remove the outer leaves first'?" Y. "It was a too heavy responsibility for me"
Y. "I decided to wash the dishes but Asano-san was cutting cabbage next to me so I thought I should not make soap bubbles"
Y. "I tried to not put too much soap on them but for some reason the grease would not come off properly so I just...[laugh][gesture of putting onto shelf]"
M. "Tell such stuff right away!" M. "A litte scared of this topic.."
Y. "You have released various goods but there are some I'd love to have!" M. "Don't need that! You released some, right?" Y. "Yes, two kinds! I want a hug pillow!" M. "Do such people really exist?" Y. "But of course! Who wants one~?" Y. "You come home to the welcoming embrace of Maaya-san! Oh,I'd love some sheets too!" Y. "Yeah, with this pose [arm pillow pose]"
M. "I'm supposed to do that?!" M. "What should I do... Oh, maybe the Deva guardian pose?" Y. "Ah-ha-ha, please do that"
Y. "I've already made two kinds. Tell me when you make some [laugh]"
M. "Not making any! [laugh] Maybe as a charm against evil spirits"
Y. "I made a list for every album [rummages in socks]"
M. "Wait, that's where you put money you don't want to be stolen"
Y. "Well, I can't afford to lose that"
M. "Why is this note so dirty? Use some clean paper!" Y. "Okay, let's start with Grapefruit! One, two! 'Yakusoku wa iranai', 'Aoi Hitomi'!" M. "Two songs? Isn't it one per album, usually? [laugh]"
Y. "Tune the Rainbow, Yubiwa!" M. "Huh, these are pretty cliched choices"
Y. "Come on, I can't just remove these"
Y. "Oh, I have an alternative list too"
M. "You're not done yet?!" Y. "Maaya-san was wearing a grey hoodie with red checkered long skirt and scarf with flowers"
M. "The one that looks hand-knit? Yeah, I've had one"
Y. "So trendy! I thought. So on the way back went to Marui, bought the same hoodie and skirt, found the scarf too"
Y. "But the scarf was too expensive. Can I say the price?" Y. "Thought long and hard, didn't buy it in the end which I still regret"
M. "Is it such a big deal? [laugh]"
Y. "I'll look for it on Mercari <online flea market>"
M. "Tell me if you find it [laugh]"
M. "'the person who came to visit the other day was just a fan' I thought"
Y. "I could not imagine I would get the invitation..."
M. "It's amazing, isn't it?" Y. "When I tell the story some people say 'well, you really went to the top' [laugh] You guys don't give up too!" Y. "Yes! Now I'll be together with everyone, so see you all at the location!" she acted like a real pro! She's one of the most respected seiyuu... says I that after she left." Last edited by roxfan on 2018-01-02 18:59, edited 1 time in total. Haha, it seemed very funny. I went there the day before, that's too bad! The new year special fanclub DVD arrived today and on it was a short movie about this year's IDS! tour. 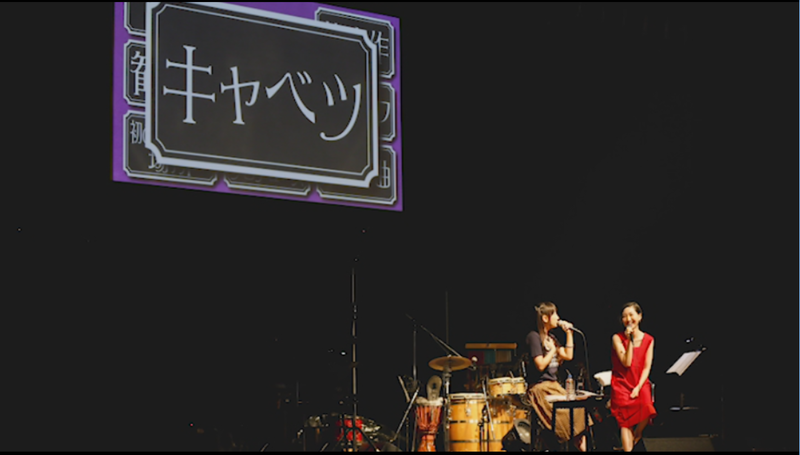 The Tokyo segment included two stills of the talk described above.